A Girl Walks Home Alone at Night is perhaps the most American foreign film I’ve seen. Its basically the definition of globalization. Though the film’s spoken language is Persian and the setting is a fictional Iranian city, director Ana Lily Amirpour shot the film in California which further contributes to the heavy imagery that seeps in 1950’s American nostalgia. Its main character is a James Dean styled hunk, the center piece is a smooth slick Thunderbird, and opulent palm trees fill the background. However, Amirpour’s visual eye isn’t limited to just the 50s. It fluidly moves the story along using various images and symbols to capture cultural aspects from around the cinematic world. A Girl Walks Home is more of an homage to the beauty of cinema than it is a budding romance of a vampire and a down on his luck boy. Amirpour goes through painstaking efforts to translate the story of an insatiable vampire roaming the streets into a look in the lives of those she comes in contact with in the neighborhood. Impeccable cinematography gets showcased through the thick beams of carefully crafted lighting that pierce through the black and white of the film creating a classic silver sheen. Nicholas Ray’s Rebel Without a Cause is an obvious influence through Amirpour’s use of off kilter framing that stretches conventional images of each frame, similar to the slanted look of scenes in Eli Kazan’s East of Eden. One of A Girl Walks Home’s more memorable scenes features The Girl emerging ever so slowly out of a bathtub reminiscent of Henry-Georges Clouzot’s Le Diaboliques. Amirpour’s scrutiny of visuals through multiple scenes at times is on par with the beauty of Martin Scorsese’s Raging Bull and Peter Bogdonavich’s The Last Picture Show. Nevertheless, Amirpour captures so many wondrous images of her own accord that comparing them to other filmmakers is merely a projection of my own film fanaticism onto the canvas she displays. A Girl Walks Home is rife with an offbeat humor, yet still manages to tighten the chest and shock in ways that a vampire film is meant to. It’s not a terrifying film by any means, but Amirpour’s pension for being a film fanatic first and storyteller second makes for some iconic, chilling imagery. During a particularly noteworthy scene, we watch as a looming black figure momentarily seems to float down a sidewalk with its back to the wall. That is until we realize it is actually The Girl donned in her black chador enjoying riding on her new skateboard stolen from a neighborhood boy. Despite its horror genre, A Girl Walks Home is rooted in chic. It combines freight with sexiness utilizing its black and white footage to accent both aspects. Costume design and wardrobe details the inner mind of The Girl even when the script doesn’t. Although she is an ominous dark figure, we get a sense of her true identity when we spend time in her bedroom witnessing her solitude. It’s an interesting twist to discover that this vampire is a slightly hip, though lonely, teen with an affection for Madonna, Patti Smith, and Michael Jackson. She rides the line between a Cure fan and a psycho murder donning black thick paint on her lips and marker thick eyeliner. Petite and sweet, Sheila Vand plays up her role as The Girl, seemingly submissive until she needs to use her fangs which she does so with the skill and ease of a practiced fisherman. Her counterpart, Arash (Arash Marandi), a good looking James Dean prototype, is an equally fascinating character to follow as we witness his crazed desire to get back his prized possession that got stripped away by his father’s crippling heroin addition. Most importantly, A Girl Walks Home plays against standard norms and gender roles defined for women. In a culture where women are taught not walk alone or sit alone in their own bedrooms when a man is present, the women of this film defy those standards either mocking the men who attempt to enforce those rules, or in The Girl’s case, savagely killing them to feed. Around the world women are often still the victims of predators who utilize their own economic power or physical prowess to control a woman. But, dressed in her chador like cape The Girl refuses to play by society’s rules even if doing so proves to be a lonely decision. She instead glides around the city delicately and quietly choosing to attack regardless if she’s provoked or not. 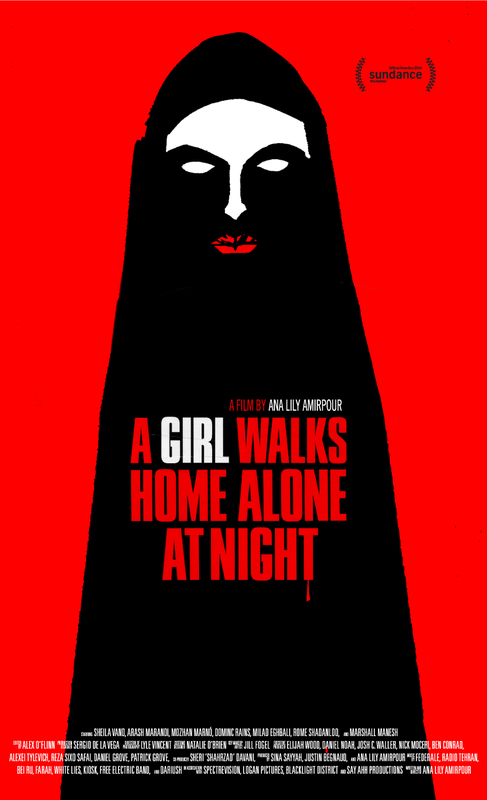 There’s no rhyme of reason to The Girl’s vengeance, more so just a loose semblance of morality, but despite its feminist or cultural implications, A Girl Walks Home Alone at Night is a film set more in a dream state meant to incite and engage. For some it may have missed it’s marked and understandably so; it’s a strange film with little explanations and scenes that are slow to develop. For me, it’s a cinephile’s paradise, one that I want to revisit again and again just to ooh and ahh at the beautiful shots and make up my own interpretations based off the images we are granted. 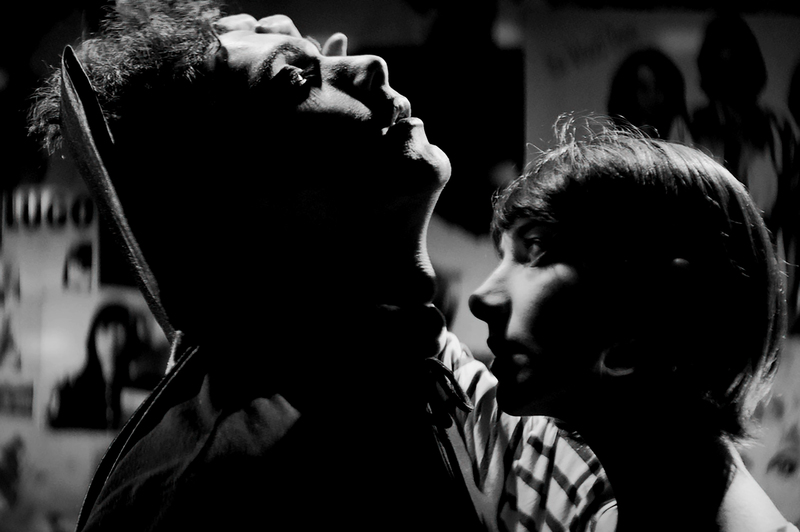 A Girl Walks Home Alone at Night may be a lot of things, but it’s definitely not your average vampire film. ← Why You Need to be Watching HBO NOW! Thank you so much Paul! Very glad to have a fellow French New Wave fanatic around! What are some of your favorite films? Wow, I have never heard of any of those apart from Vivre Sa Vie of course. I have a lot of new movies to watch now! As for myself, my favorites would have to be Breathless, City of God, Head, and Boogie Nights. There’s dozens more but those are the batch that I could probably watch forever and still be affected by every time. The Monkees movie? Awesome! Yeah, that’s a trippy one!! Haha yeah I love the surrealism of it, plus the soundtrack is killer! My favorite, right up there with “As We Go Along”! Really great review! “A Girl Walks Home is more of an homage to the beauty of cinema than it is a budding romance of a vampire and a down on his luck boy.” <~ YESSSS! Loved this and would love to use your review as an example in my thesis for my film class in college. May I have your name so that I may give you the proper credit? If not a full name, your first initial and last name would suffice! Thanks! !